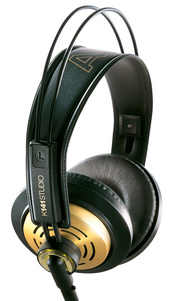 I used to have these old classic K141 headphones along time ago. Solid construction - but more important - they sound good even at very high volume levels. I used to really put them to the test, and nothing... in the end they wore out mechanically. I now bought the updated Studio version (55 ohms). It's easier to use with mp3 players and at work (computer output). The result: many albums got a whole new life and sound - I'm very pleased. The sound is close to neutral. Bass is better compared to the more common ear plugs that many use. It's on a whole different level really. I now see (damn) AKG just released the MK II version. Content updated 10 March 2019. <URL: http://boralv.se/blog/?id=1202741849>. This server is able to calculate 29 pages like this per second. No computers were harmed in the making of this page. CSS Validator, HTML Validator.